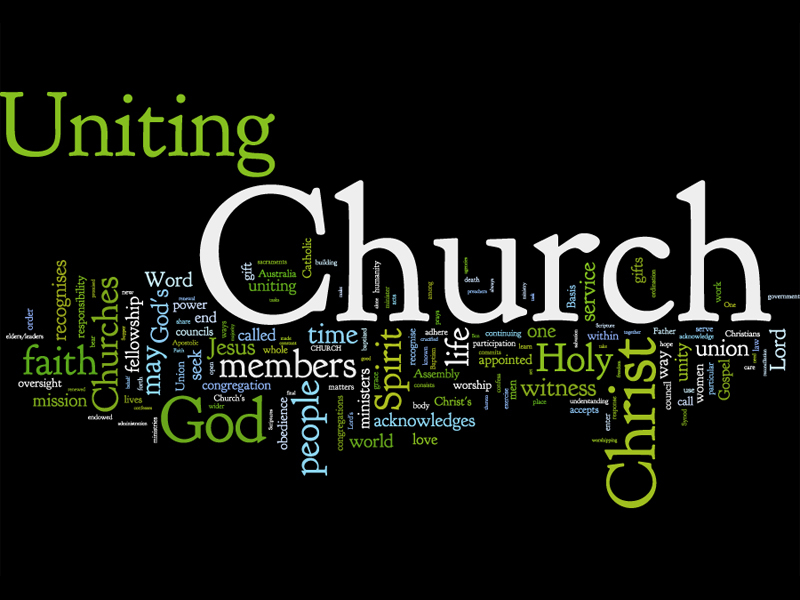 I'd like to think that I was the first person to ever Wordle the Uniting Church's Basis of Union, back in in 2010. I reckon I have a pretty good claim to that. Ha. Wordle is a "word cloud" image based on the frequency of words in a particular text. The more a particular word features in a passage, the larger it appears in the image. I recently used this feature in nVivo as part of my PhD research, analysing my interviews. 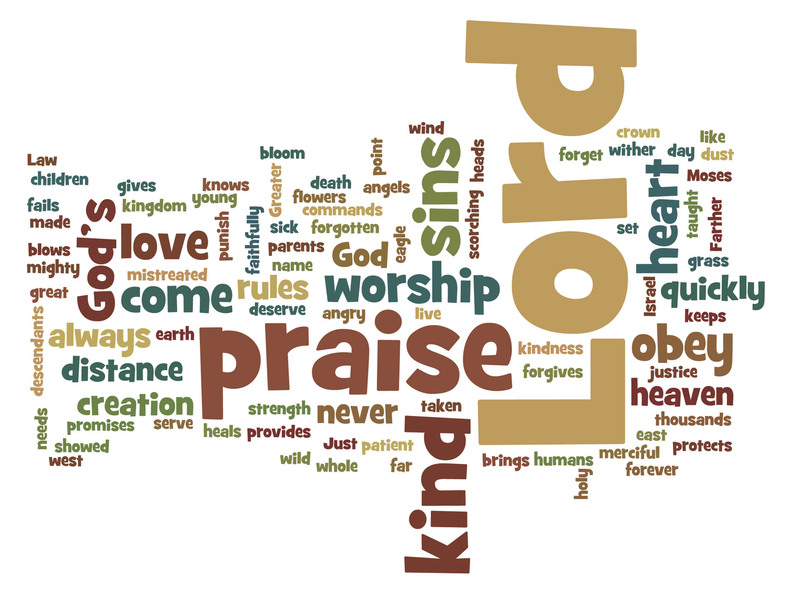 The Wordle website was developed by Jonathan Feinberg several years ago as an online toole for making these word clouds. The WWW app/format that it was based on is now rarely used - the Java 2D API. So he has created a downloadable application which I tried for the first time today. It works fine on my Mac. But rather than saving the files as PNGs, I print them to disk as postscript files and then resize them in Photoshop for printing to A4 at 300 dpi. Here are my creations of John 15 and John 14-17 from the NRSV. I'm going to use them together as a visual comparison alongside texts. I kind of like the "In the beginning was the Word" connection, which is actually part of the conext for the use, namely Jesus' words to his disciples framing a Trinitarian context for mission that connects past, present and future. Here are a few other Wordles that I've made. It was in the days before our people had a king. Peninnah and I were both married to Elkanah. Oh yes, that was not uncommon in Israel. My name is Hannah, and I was Elkanah’s favourite wife. It was obvious to everyone, including Peninnah. You would think that would have made me happy, but I was deeply unhappy. Peninnah had given Elkanah several fine children, while I had not given him any. Peninnah regularly reminded me of this and said that God was punishing me for some reason. The times when she was most rude were when we went to the place of worship at Shiloh to offer our annual sacrifices to God. We would always pray for God’s blessing. You can imagine what I always prayed for! But I remained empty in body and in my heart. Elkanah would try to comfort me, but it didn’t make me feel any different. Rosefield Uniting Church's second annual biblical teaching weekend is coming up on 15-17 May 2015. The focus will be on the Psalms and our speaker is Dr Liz Boase, Lecturer in Old Testament Studies at Uniting College and Head of the School of Theology for Flinders University. Liz is a an excellent speaker. We'll also be offering workshops on praying, singing, seeing and speaking the Psalms. More info soon. Ben Myers recently presented two excellent sessions at the annual Synod meeting on the Uniting Church SA on living into the Scriptures. His first session drew on the "Festal Orations" of Gregory of Nazianzus, a 4th century theologian and preacher. Gregory's remarkable sermons retell the Gospel narratives in the first person, with the hearer being imported into the story, reliving it in the here-and-now. One of Ben's observations was that four gospels are required to provide the fullness of the biblical world that might in a sense, encompass our world, our place, our time. His second session drew on Athanasius' fourth century exposition of the Psalms. In this instance, Ben invited us to reflect on how we sing our way into faith, and on the Psalms as a canon for the whole of human experience. This notion of being a people shaped by the Word has long been a theme in Christian education. In his excellent book, "A Pilgrim People" (now available on Kindle), John Westerhoff says "Our identity is dependent on having a story that tells us who we are; our understanding of life's meaning and purpose is dependent on having a story that tells us what the world is like and where we are going... The church is a story-formed community." In this particular book, Westerhoff traces the liturgical seasons of the Church Year as the narrative arc of Christian faith and identity. In a different sense, Walter Brueggemann, in "The Creative Word", describes how the canon of the Old Testament by its nature is educative in terms of both substance and process: "how the biblical material reaches its present form (canonical process) and the present form that it has reached (canonical shape) are important theological matters that tell us about the intent of the biblical community." Bruggemann then examines the role of narrative, prophetic poetry and wisdom literature as three strands or modes of biblical education. The narrative of the Torah states the community ethos, the prophets disclose the pathos of God and Israel, and the wisdom literature frames the logos, or the sense of order and meaning in life. In his book "Biblical Perspectives on Evangelism", Brueggemann describes evangelism as "doing the text again." There is a wealth of insights here about education as learning to live into and live out of the biblical narrative, and about learning to acquire a scriptural imagination (see an excellent collection of essays in Duke Divinity School magazine here.) How do we teach in ways such that the biblical narratives form and frame our imaginations? How might we craft learning experiences that derive from "doing the text again" with our own faithful improvisations? I'll let you know if/when Ben's sessions go online. Ben's excellent blog is here. My free copy of the 2013 Upper Room Disciplines just arrived in the mail. I was asked to write a week of daily reflections. The resource is used worldwide, with the readership of about 60,000 people. I think its the only time in my life when I'll get to be in a book which has Will Willimon as a co-contributor! The editor and I had a real battle over a number of my reflections in terms of either biblical interpretation or modern application, quite unlike my previous work for the Upper Room on other resources. It was worthwhile, rigorous discussion, and shows how seriously they take their role in producing prayer resrouces that take Scripture seriously. I had done my exegesis carefully and wasn't prepared to back down. It also showed me how difficult it is to work with an editor whom you've never met face to face when the two of you just can't seem to 'get' what the other is saying. One of the debates was about my writing of a modern parallel of Jesus entering Jerusalem for Holy Week, and making the main figure a female. I was told that someone thought it was a pro-Sarah Palin statement! In fact, it was written just after Kevin Rudd got shafted by the Labour Party. I was thinking about how forces so easily turn against a perceived saviour. Anyway, my prayers go to the Upper Room team, and to those who might use this resource next year to aid their spiritual journey. Here in Australia you can get it from MediaCom. jim le page is making a poster of each book of the Bible. they're remarkable. and when i dont like them, they remind me that the book, more so than jim's art, is from a foreign place and time. thanks to maggi dawn via Facebook for this. Luther Seminary in Minnesota, USA is running a Lily-Endowment funded Vibrant Congregations Project. Someone has identified six critical areas of vibrant congregational life and culture (no, not ten or five - six...). Congregations with these attributes will be studied. The big question of course is what kind of thing they're hoping to learn. Is it about what they do, why they do what they do, what processes led to the latter, what enabled those processes to take place, and what they say about the 'identity' of the congregation....?? The Project blog is here. so glad that the vintage Jesus video clips are on Youtube. not the best quality but there nevertheless. brilliant! thanks to matt stone for posting about the infinity Bible project. this is a website with multiple versions of the Bible (no NRSV...) in multiple languages. the interesting thing is that it's interactive in a 'social newtwork' kind of way. you and your friends can share notes on the text, sermon ideas, questions, etc. as with other social online platforms, you can follow and friend people in order to share your thoughts with them or simply read theirs. on signing up, i was confronted with a long list of academics and Christian leaders who I could follow (mainly US, mainly white, mainly 'evangelical'). I go to Matthew 6, the Lord's Prayer, and there next to is is a link to a website with a sermon that someone has preached on this text. I can highlight text and add notes myself. The current online tools (Matthew Henry commentary and Strong's Concordance) are, well... sooooo last century! At present there mainly seem to be links to other online stuff that the famous folks on the site have written. eg. Genesis 1 and there's a 'related' link to Tony Campolo talking about women & leadership in the church. a long bow perhaps? Anyway, it's an interesting concept and worth a play. Go watch the intro movie.